One of Romuald Yernaux's best moment as a basketball coach came on 23 May 2010 when Charleville-Mézières won the NF1 French Championship. 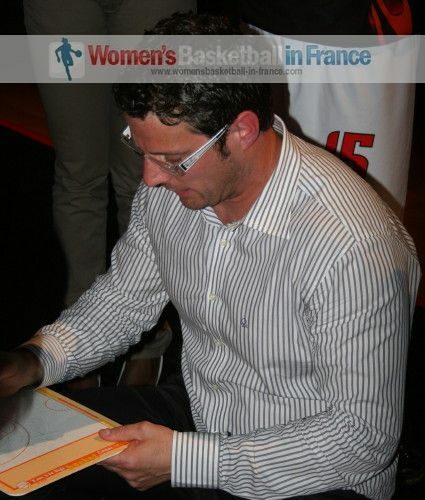 It meant that his dream of one day coaching a team in the Ligue Féminine de Basketball (LFB) had become reality. Veuillez regarder la vidéo en bas de la page et découvrez ce que Romuald Yernaux projete pour la fin de la saison. Yernaux started his coaching career at Charleville-Mézières, then called ASPTT Charleville-Mézières in the 2001-2002 season. His team was then playing in the regional league (Division 5). In his first two seasons the club won back to back promotion and started the 2003-2004 season in NF2 (Division 3). It took just two seasons in NF2 to win promotion to NF1 (Division 2) in 2005. In four seasons in NF1, the club appeared in 2 Final Fours, had a third place in 2008 and were winners in 2010. 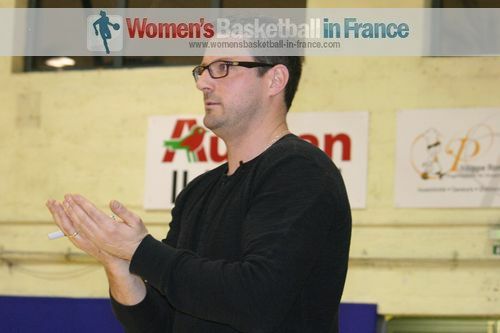 As a basketball coach, Yernaux shared all his success from 2004 until 2011 with his then assistant Frédéric Malherbe. While in NF1, Charleville-Mézières were French Cup specialists. Already in 2008 Charleville-Mézières eliminated Illkirch-Graffenstaden (76-62) at the same stage of the cup competition than in 2013. They then hosted LFB club USO Mondeville in the next round of the Cup and won (80-69). In 2009 they eliminated another LFB club from the competition, Arras. Romuald Yernaux has taken all his coaching exams and today he is one of the most exciting coaches in French basketball. Although it can be fun watching him in action, especially his coaching style has got him into trouble with officials. He had picked up six technical fouls last season and has recently served a three-match ban but must remain on good behaviour over the next eight weeks to avoid further bans. Why we at womenbasketball-in-france view Yernaux as a basketball coach and not as a trainer is because he actually works on developing players. Amel Bouderra, Djéné Diawara and Ekaterina Dimitrova are three players that have all made noticable improvements in many aspects of their game over the last three seasons. Yacine Séné is striving once again and Anne-Sophie Pagnier's shooting is coming back. Yernaux likes to keep things simple and wants his players to follow his instructions to the letter. During a game he uses up a lot of energy pacing up and down his coaching zone as he tries to get his ideas across. This season has been hard for the basketball coach of Charleville-Mézières because of injuries and administration problems. He is yet to have a full roster of players for a game this season. When we spoke with Romuald Yernaux on 25 January 2013, Anne Sophie Pagnier could not play and Johanna Joseph required the use of a face mask to play. After the game against Illkirch-Graffenstaden he spoke about the upcoming games and his objective of securing their place in the LFB as soon as possible. You may listen to the interview by clicking on the video on the left. He explained that he is not relying on teams below them in the table to lose their matches for his team to survive. Their next match against USO Mondeville is important because a victory will improve their standings in the table and will be good for the players' moral. The match after they travel to Lattes Montpellier, the current leaders. For this game he has no expectations. But then they will play Hainaut Basket in a match they cannot afford to lose.